In the Netherlands, a new billing system for public toilets which is based on mobile wireless technology has been developed by “NeoNumus”. The costs incurred for provision of the facilities, cleaning and maintenance are paid quickly and simply by the customer by “mobile phone” via a cashless system. This system reduces the waiting time for service and maintenance and improves protection against break-ins. Which technology does this system use? Most people take their Smartphone with them wherever they go. What could be easier than using your phone to open a door? The concept was designed so that even ancient mobile phone models can do this. USSD is used rather than SMS. A number of services in the GSM network are based on USSD. The call, or the request to make a connection, is already a USSD in itself. The round trip for the USSD out to the server and back takes around 2 seconds. A text message needs 6 to 10 seconds in one direction only. However, sometimes it can even take anywhere between 6 minutes to 6 days, or the SMS is not delivered at all. With USSD, the acknowledgement arrives immediately as the door is opened. The service – the opening of the door – must also be billed. The USSD is sent by the network operator in two directions to a “NeoNumus” server. This means that the SIM card must be billed somehow. There is also further access to other servers for billing of the service via the network operator. Inexpensive GSM modules are employed, however, inexpensive in this case was not quite cheap enough. The most cost-effective GSM module was still way too costly. The costs of the module have been balanced out by an intelligent installation concept which uses an integrated antenna. 18 years ago, the author was a remote vending project manager for a service provider of vending machines. This company covered everything, from filling the vending machines to their installation. Back then, it was established that over 90% of machines could be equipped with wireless technology and this was also the case when the antennae were built into the vending machines. Since then, the availability of wireless has improved even further. If the antennae need to stay inside the machines, there is no need to drill any holes. This practical experience has undergone even further refinement. Why buy an antenna when you can build one yourself? 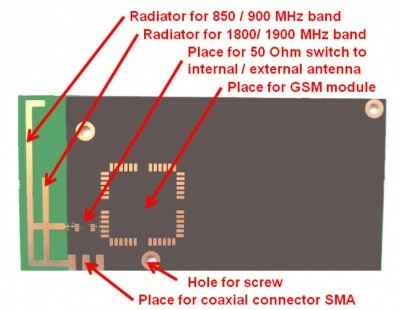 The GSM antenna, the GSM module and the remaining electronic components are located on the same PCB. Standard enclosures generally have four domes with a screw in each corner. These enclosures have now been optimized to just three screws below the antenna. This eliminates the influence of the screws on the antenna (even plastic screws can affect the antenna). In addition, the antenna ground plane is adapted to the required physical size at 45 mm x 90 mm. For systems without a power supply, an antenna toggle switch to the external antenna socket is available. The scan operation of the GSM module is launched twice when the PCB is first put into service. Once with an external magnetic antenna installed on a large metal plate, and a second time with the internal antenna on the PCB. The result: the internal antenna was able to receive more base stations than the external model. This concept saves on external antennae and significantly reduces installation costs. The savings versus the costs for the GSM module are neutral. 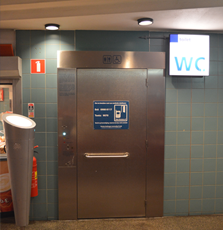 Besides, the PCBs were developed for vending machines, not for toilets. Standardized interfaces can help with the use of these PCBs for vending applications.